The Bear Archery Montana longbow is hailed for its smooth surface, speed and grace. Its narrow, yet, powerful limbs are reinforced by glorious black fiberglass for an added effect. With a crowned arrow shelf, as well as a cushioned leather grip, this bow is designed for comfort and stellar performance. The specifications of this bow are as follows. Firstly, this bow consists of a 64” AMO, a Dynaflight 97 Flemish string, along with a leather grip. This bow also consists of limbs with a white, maple overlay, along with black fiberglass construction. The riser is also composed of hard-rock maple. The design of this product also permits clean and seamless usage as well, providing fluid arrow flights. Because of it quality construction, this bow offers several pros and benefits. Firstly, this model is characterized by an innovative, reflex-deflex design, which minimizes shock against your hand. This design feature also increases the intensity and the quality of your hunting experience as well. The limbs are relatively easy to draw, and they provide both a steadfast and speedy performance. The grip, which consists of a hand locator, is very traditional for those who prefer a classic longbow experience. The draw lengths of this bow are actually designed for your individual comfort also. In spite of its positive reviews, there are a few cons associated with the model. While many reviewers described this as lightweight, one review in particular described it as heavy. So, perhaps this is a matter of opinion. Finally, another customer commented that the grip is not engineered for the human hand. Therefore, this may require some adapting on your part. Another potential con is the handle wrapping consists of only a thin foam sheet, which to some, appears cheap in quality. But the bow itself is both majestic and beautiful. Customers are purely satisfied with this longbow model, as the reviews speak for themselves. Among many descriptive adjectives, the term “perfect” has been used in reviews to describe this model. 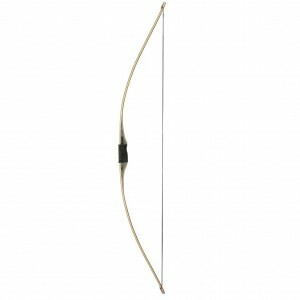 Firstly, customers praise this bow on its keen ability to shoot. The draw is seamless and fluid, and its anti-shock properties prevent it from vibrating excessively upon release. Other customers have described this bow as lightweight, as well. Furthermore, it is designed to release quiet and subtle shots. In fact, this bow is so quiet that onlookers often ask questions about it. Virtually every customer praised this bow’s aesthetic beauty. The beauty, is often, one of the first attributes that the customers praise, along with its functional quality. According to one customer, everyone who sees the bow feels compelled to comment on its appearance. The reflex/deflex design also contributes the speed and agility of this bow, which several customers have mentioned. This bow was described as so powerful that it can be used on large game in North America. Furthermore, even with frequent use, this bow is know to be highly durable as well. Finally, customers have said this bow blends historically traditional bow components with more contemporary components. And although the limbs are narrow, they are incredibly steadfast and durable. This product could not be more immaculate and the positive customer reviews are a testament to this. Not a single negative review could be detected on the sales page, and this speaks to its quality and the candor of the bow’s description. Any company can give its products an appealing description. But this product truly lives up to its reputation and its specifications. Based on the exceedingly positive ratings, the specification, as well as the beauty, speed and durability of this model, it is highly recommended.